The smartphone industry is expanding at a fast pace. At present, there are 5 billion mobile phone users around the globe and are expected to grow more. And with this exploding market of smartphones comes a flourishing trend in the business world – BYOD, meaning Bring Your Own Device. It encourages the employees to bring their own devices to the workplace, especially the smartphone devices. This has led the enterprises to have robust applications that could cater to the needs of employees as well as the customers. Majority of enterprises prefer development of mobile apps using cross-platform technology, which allows developing mobile apps that can be used on multiple mobile platforms. It is a challenging task to decide upon which framework could be the best for developing the mobile application – Ionic or Reactive Native. Let us brief you about these two popular frameworks so that you can decide upon which framework is better for the development of your mobile app. Ionic is a cross-platform framework provided as open source. It is primarily used for hybrid mobile application development and is based on the HTML5 programming language. It inherits the structure and design of Angular JS to some extent; along with some of the design elements from Android, Material Design and iOS. Further, it is TypeScript ready which indicates that the developers can also use Angular JS components. Ionic comes with readymade styled components which makes it really easy for the developers to create User Interface of the app. The UI is not native but it can easily give the appearance of a native UI. Ionic works with Cordova, which helps in accessing the phone hardware functionality. The main work of Cordova is to render the app – Web View, which is a browser free web page loader, providing access to various mobile functionalities. It is a bit slower as compared to React Native as HTML code is written for making it work with Android. In case of slow processors, performance issues or graphical issues are more likely to arise. Further, it requires plugins to be downloaded for accessing native functionality. While working with TypeScript, the tasks become a bit slower as compared to working with the native API. Ionic can easily work with the various web technologies such as HTML, CSS, JS or AngularJS. It is platform independent and has faster development testing cycles. Default mobile apps with excellent User Interface functionalities can be easily and efficiently build. It is compatible with both iOS’s UI web view and Android’s Web View. TypeScript can be used to easily write the code to develop applications for all platforms. Plugins can be used to access the native functionalities of the user’s devices. If lot of callbacks to the native code is used, performance issues can arise. If native look is preferred in all the devices, it could not be so appealing to the users. It is difficult to develop advanced graphics or interactive transitions. It is basically an extension of React.js using almost same principles like Virtual DOM for updating UI. The drawback of using React is that it focuses heavily on the user interfaces making it a bit slow while communicating with the underlying native OS. But a plus point of using React Native is that this is not a browser based app similar to PhoneGap or Cordova of Ionic; thereby making the implementation and execution quicker on mobile devices. It is not like ionic, which is designed to write once and run everywhere. Some platform specific changes are required in the program to create a closest native look. The same code based can be used for developing applications for Android, iOS, Windows Phone. Better performance than ionic because a specific platform is there for processing hardware functionalities without using Cordova or PhoneGap. React follows stricter design patterns making it easier for the developers to maintain large projects. It helps the new developers to learn quickly and speed up the development process as it is managed by a very strong community of developers. Since the code can be reused while using React Native, the delivery of apps is quite fast. Problem-solving is fast as the issue can easily be discussed in the React Native community. The developed code can be used across different platforms i.e. it is independent of iOS and Android platforms. Sometimes it becomes really difficult to convert HTML code to native one. The coder must know ObjC/Swift to resolve the problem. React was basically built for iOS and hence, some components for Android require changes by the developer. The main objective portrayed by React Native is “learn once, write anywhere”. This means using the same framework and components. In React Native, the Native features of the device are used without the requirement of any plugin. React Native is for those apps for which performance is on top priority and they have a little high budget. 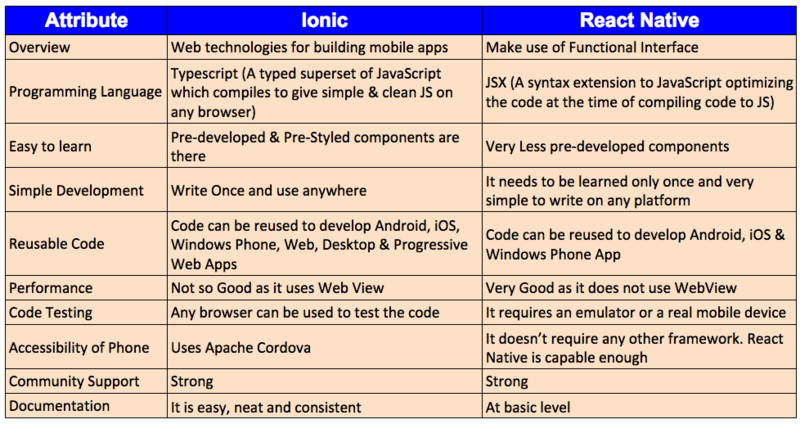 From the above comparison, it could be concluded that both the frameworks – Ionic and React Native are completely different from each other, but serves the same purpose of mobile app development. Now which one is better – ionic or react native? Based on the code reusability and excellent performance of the mobile apps built using React Native, it is more optimal to use React Native than ionic. Which one do you like – Ionic or React Native? Mention your views in the comments below.